Last month, the Metro Toronto Convention Centre (MTCC) hosted the 62nd Annual Meeting of the American Academy of Neurology (AAN). The AAN Annual Meeting is the world's largest gathering of international neurologists with more than 10,000 attendees and over 2,300 scientific presentations on brain research. "As the fourth largest medical community in North America, we are thrilled to be able to bring the AAN Annual Meeting to the great city of Toronto," said Christine E. Phelps, deputy executive director of the American Academy of Neurology. "Toronto's culture, tourist attractions, restaurants, hotels and medical community make the city an ideal destination for our Annual Meeting attendees." In recognition of the AAN Annual Meeting and the efforts of the AAN Foundation, a Toronto mayoral proclamation was issued declaring the week of April 11th as "Stop Brain Disorders Week" in the city of Toronto, and there was a special lighting of Toronto's CN Tower on Sunday, April 11, 2010. "Stop Brain Disorders Week" aimed to help the American Academy of Neurology Foundation raise awareness about the vital need for more research into the prevention, treatment and cure of brain disorders, which currently affect one in six people worldwide. Common brain disorders include Alzheimer's disease, stroke, migraine, multiple sclerosis, autism and brain cancer. Donations to the AAN Foundation can be made at www.buyabrain.org. "We are thrilled to host an international event of such positive medical impact involving neurologic disorders. The AAN Annual Meeting is significant in the future practice of medicine in the world," said Barry Smith, president & CEO of the MTCC. This event also had a positive impact on the local economy of over $17 million from delegate spending. Toronto is the fourth-largest medical community in North America, with 100 hospitals and research institutions as well as providers of pharmaceutical products, medical devices and technology, diagnostic labs, health care services, IT systems and hospital supplies. The American Academy of Neurology, an association of more than 22,000 neurologists and neuroscience professionals, is dedicated to promoting the highest quality patient-centered neurologic care. A neurologist is a doctor with specialized training in diagnosing, treating and managing disorders of the brain and nervous system such as stroke, Alzheimer's disease, epilepsy, Parkinson's disease and multiple sclerosis. For more information about the American Academy of Neurology and the AAN Foundation, visit www.aan.com. 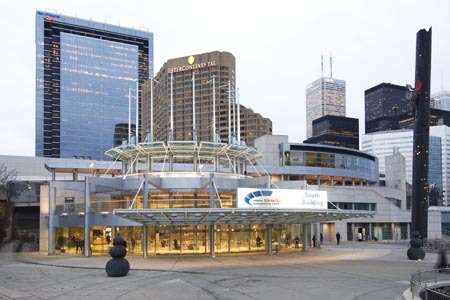 The Metro Toronto Convention Centre is Canada's No.1 convention and trade show facility. Since its opening in 1984, the MTCC has hosted approximately 15,000 events and entertained over 40 million guests. For further information, please visit www.mtccc.com. Complimentary hors d’oeuvres, served daily from 5:00 - 7:00 p.m.
Two-hour complimentary use of eight person boardroom, based on availability. For enquiries and assistance with making your reservation, please contact a reservations specialist at Pan Pacific Vancouver direct: USA - (800) 937-1515; Canada – (800) 663-1515; Mexico – (800) 514-9086.